Pathways to Stem Cell Science | Did Dinosaurs Have Stem Cells? We charge a nominal fee to cover the cost of lab materials and time: Half day: $350 (up to 40 students); Full day: $500 (up to 80 students); $5 for each additional student above 80. Did you know that stem cells enable some Lizard species can regrow their limbs and tails? "Did Dinosaurs Have Stem Cells?" is a ground breaking mobile lab program that enables young students aged 4-9 to explore the exciting science of regeneration, working hands-on with stem cells in their own classroom! 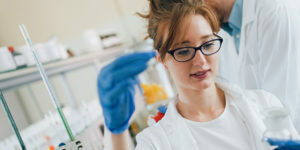 This unique program, only available at Pathways to Stem Cell Science provides an inspiring introduction to basic cell biology, regenerative stem cell science and scientific research. Students take on the role of paleo stem cell biologist, investigating the fascinating question of whether Dinosaurs might have possessed the same regenerative capacity as other reptile species. They use scientific method, inquiry driven research and real-life biochemical assays to formulate and test a research hypothesis, detecting the presence of putative "Dino stem cells" among a sample of four mystery cell types we grow in our professional biotech research lab. They also analyze and interpret their experiment using a professional research microscope, under the guidance of professional industry scientists. Guaranteed to foster interest in the sciences, "Did Dinosaurs Have Stem Cells?" is the ONLY mobile lab in the world that brings real life cells and scientific research methods into elementary learning environments. "Did Dinosaurs Have Stem Cells" is a 1 hour mobile lab class designed for delivery in any classroom or community hall. It can be taught to multiple classes of 20 students in half-day or full-day blocks. JOIN Pathways to Stem Cell Science Newsletter. Subscribe to our email newsletter today to receive updates on the latest news, events and special offers!